Hello beautiful people. It’s Day 3 of The Quote Challenge. 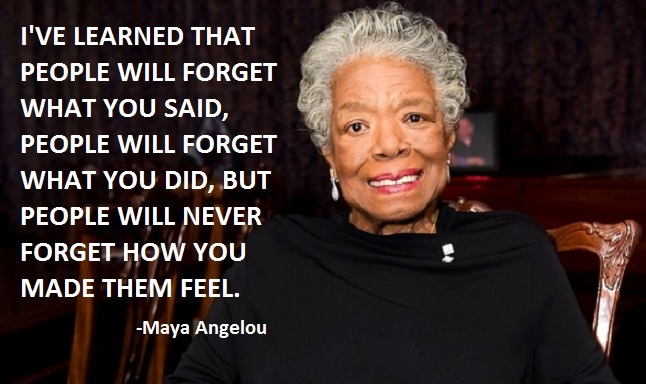 I’m back with yet another inspiring quote from yet another inspiring author and achiever – Maya Angelou. Her life and her life’s struggle itself is so inspiring, no wonder every word she has written is beautiful. I have always believed in this – no matter who you are, no matter how many degrees you have, no matter how much money you earn, if you cannot make yourself a good human being then your wealth is hollow! I have myself tried to learn the good and bad from life’s situations – and it’s not that hard after all. Tina, I love Maya Angelou's words. They are very inspiring.